Another version of Hasselback chicken, this one from my imagination. I love the taste of tomato paste and use it when I make from-scratch pizza in lieu of another sauce. Add bacon and cheese and you have all the yummy food groups. 2. Slice across the chicken, about ¾ inch apart, but only cut about 80% of the way through. 3. Cook the bacon over medium heat until about halfway done, then cool enough to handle. 4. 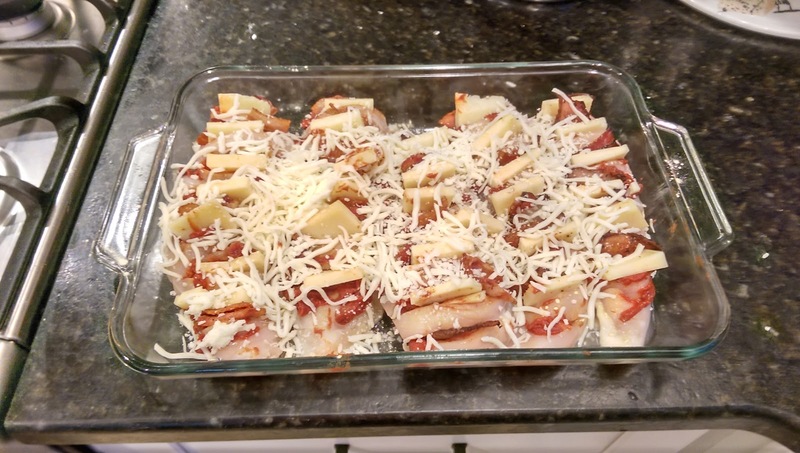 Fill the slices in the chicken with tomato paste, then bacon and finally Parmesan. 5. Sprinkle the chicken with garlic powder and top with mozzarella cheese. 6. Bake in the center of the oven for 20 minutes (or more) until the chicken is completely cooked.